When I first attend TribalFest™ in 2002, the entire weekend program was printed on two sides of a single sheet of paper. This year at TF™ 13, Saturday’s schedule alone took 2 ½ pages. Add Sunday’s page and ½ of scheduled performers and you can understand why I saw only a fraction of the performances available over the weekend that I was in attendance. Luckily, for all of us, the level of talent is so high that no matter how briefly you may sit you are bound to see something outstanding. It is from my limited perspective that I offer these comments. 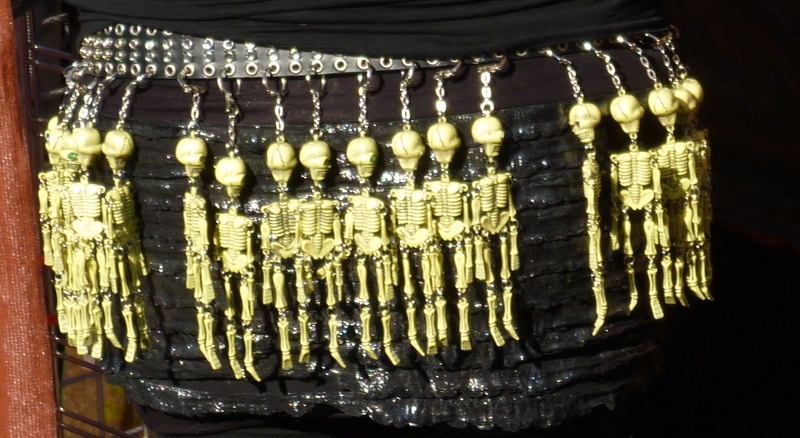 This years theme, Halfway to Halloween, was represented in décor, costume, and choreography. Actually, I had expected more dark and gothic styles on stage but these trends seem to be fading or transforming—or I just missed ‘em. I did see several Halloweenish performances that stood out. Jodi Waseca’s solo was haunting and nightmarish. Her choice of music and makeup combined with her long, thin body and fitful collapsing movements produced a danse macabre. RockABelly’s hilarious superhero suite expressed a lighter side of Halloween. This troupe never misses with their witty theatrics and solid technique. This year, dressed as superheros, they danced to “I Want Candy” while they threw candy from their jack-o-lanterns which they then balanced on their heads. For “Thus Sprach Zarathustra” they ripped off their silver lame superhero capes which they spun into a veritable light show. Their final section consisted of balancing swords atop their heroic bat ears and diadems. Original and exciting choreography throughout. Two other large group performances top my list of highlights: the debut of the first all male tribal bellydance troupe, The Uru Tribe; and the joyous farewell tribute for John Compton with Hahbi Ru. The Uru Tribe consisted of ten men who devoted their performance in part to their predecessor, John Compton. They entered, danced, and exited to the riotous cheers of the mostly female and highly appreciative audience. Yes their steps are the same as women’s, yes, the costumes are basically the same, and yes, their skills stand equally beside the female dancers. But their very gender adds a layer of subversion that heightens our excitement and fits very well with the spirit of Tribal. And if anyone has any doubts about whether or not a man can bellydance, I direct you to the videotape. John Compton’s partner and HR cofounder, Rita “Rebaba” Alderucci arranged for two tribute performances for him to be performed once at Rakkasah and one last time at Tribal Fest™ 13. 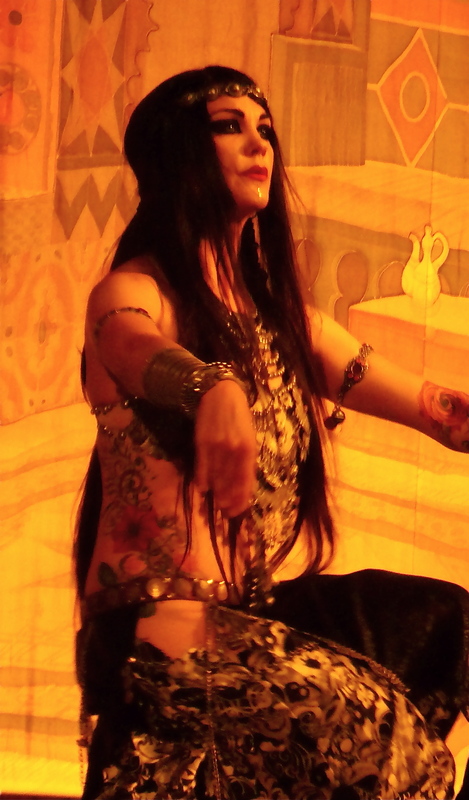 Compton taught and performed at these festivals and inspired many men to take up bellydance. The Tribute featured many of the ethnic dances he and Hahbi Ru made famous, dances from Tunisian, Turkish, Egypt. Compton’s always delightful Moroccan Tray Dance which typically ended a Hahbi Ru performance was absent. Instead, Compton’s tray and tea cups sat on stage, on a chair crowned with a poster of him performing the dance. Its hard to believe we will never get the chance to see him perform again and I am deeply grateful that I had the opportunity. When TF™ began, the predominant style presented was ATS® and its earliest offspring with its group improvisations and multi-colored costume. Over these 13 years, we witnessed the evolution of alternative forms inspired by Gothic culture, Steampunk and Burlesque. 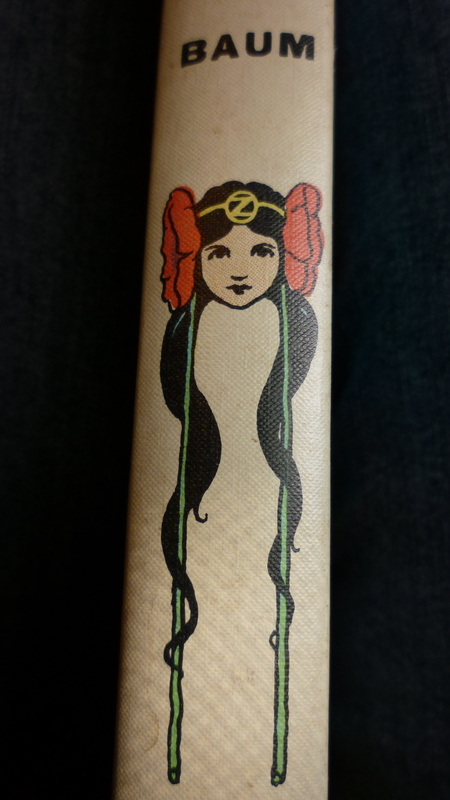 Today, the aesthetic influences are from the art nouveau, fin-de-siecle era. Not sure what they call it: FlapperPunk? The costume, based on the bellydance bedlah, is sleek, elegant and luxurious and often features exquisite diadems and decorative headdress that blossom at the ear. 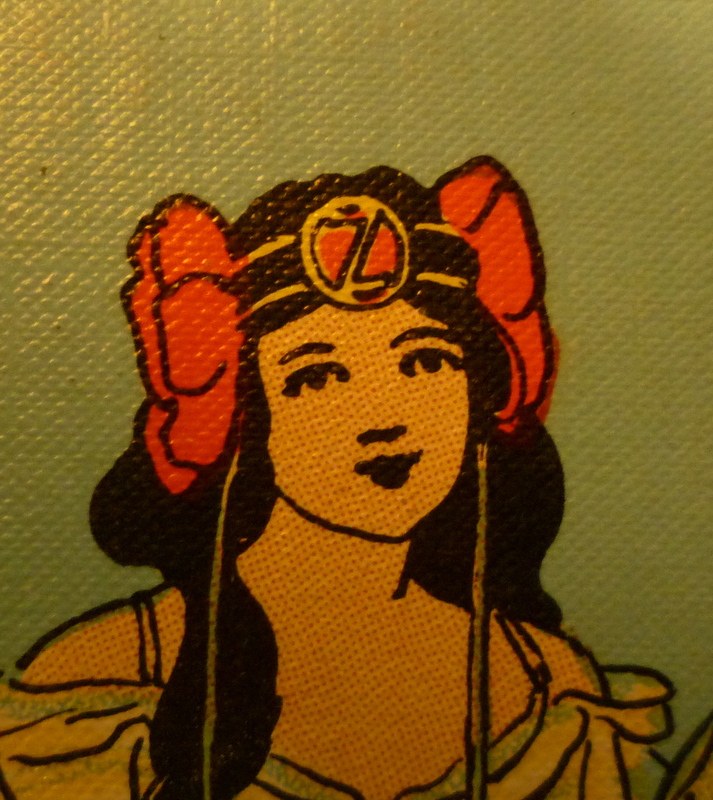 They remind me of these 1907 John R. Neill illustrations of Ozma from L Frank Baum’s Wizard of Oz series. Santa Cruz has always had a strong presence at TF™ and this year was no exception. I look forward to seeing local friends at TF™—it takes an out-of-town festival to get us all in the same place. TF™ takes on a hometown feel where you bump into friends—or make new ones—in the marketplace or resting on the stairs to people-watch between workshops. 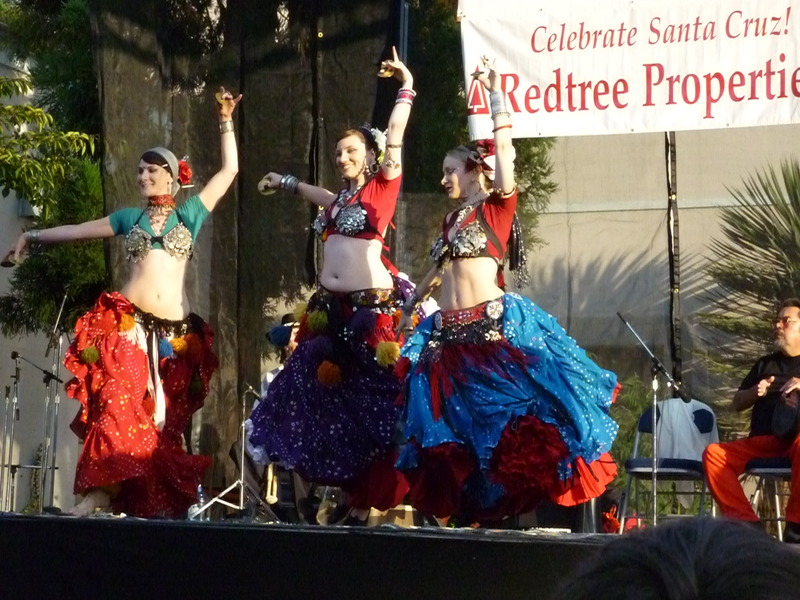 I’ve known many of the Santa Cruz dancers from when I was baby bellydancers with Palika and Helené. Over the years, I have watched them—especially Siwa, Misty, Shawn, Beth, Valli, Didi, Cathy, Janelle, Crystal—perform on TF™ stages. They performed as soloists and as members of troupes: Dancers of the Crescent Moon, Shivaya Tribal Bellydance, Tribal Moon, Persephone Dance Company, Raqs Hakohaveem, RaqsAraby and this year Desert Dream and MUSE Dance Collective. 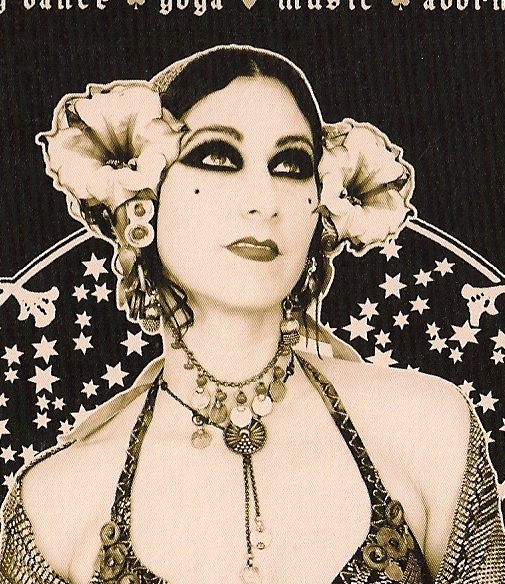 MUSE is directed by Tamara Juel, who along with soloist Chandala Shiva bring the latest trends in modern tribal bellydance to Santa Cruz. It has been a pleasure watching all of you grow as artists. The spirit that drives us all to TF™ has been heightened recently by its presence on Facebook. Chuck keeps everyone up to date on developments and fans share news about which classes and workshops they have signed up for, who’s performing, which after-party they are attending, and generally their growing excitement. And here’s a tip: if the class you wanted to take is sold out, fear not. Just check in on Facebook: Nearer to festival time, you can pick up classes the early birds are selling because their plans have changed. You can also hook up with potential rides and roommates. Post-Fest you can find video links to the YouTube TF™ channel. Here’s the link to the Hahbi Ru tribute to get you started. 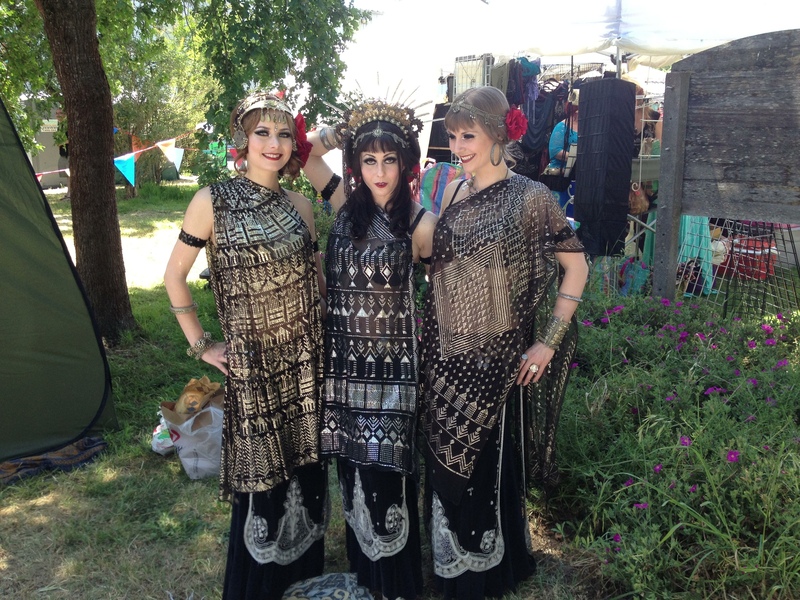 This entry was posted in Bellydance, Event Review and tagged ATS, Bellydance, Tribal Fest, Tribal Fusion. Bookmark the permalink. 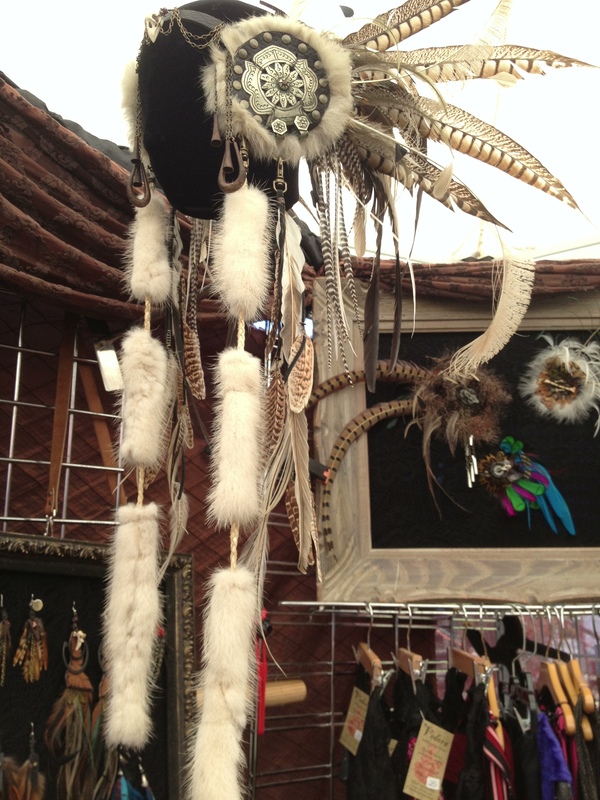 My apologies to both IrenaXara and Jodi Waseca. The error has been corrected.